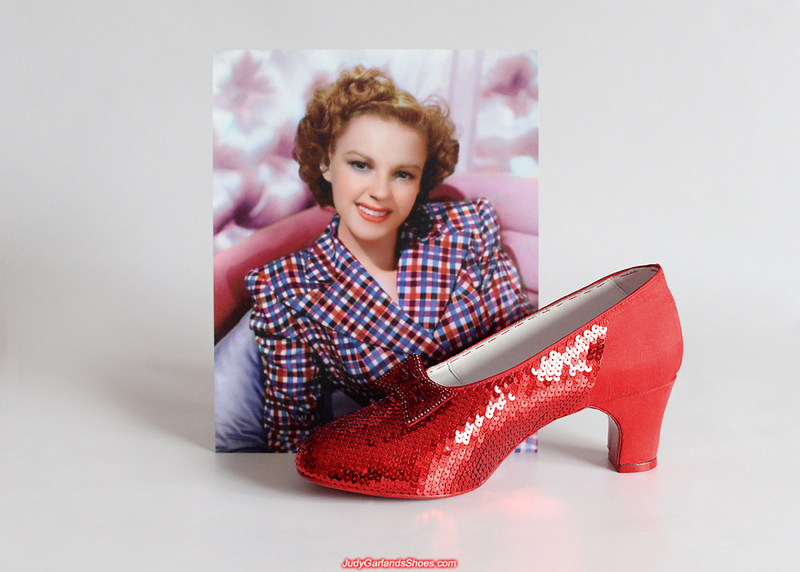 A female fan has commissioned us to craft a pair of hand-sewn ruby slippers in size 7 US. 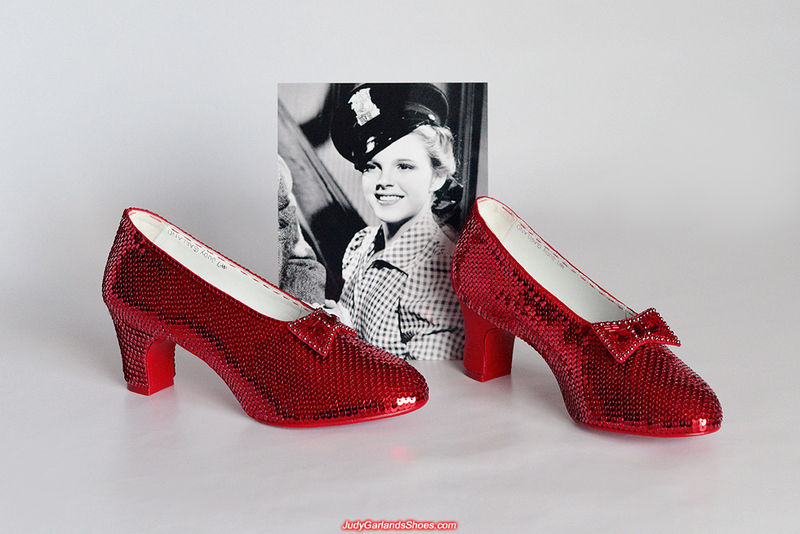 The shoes and wooden heels all handmade from scratch to match the same brand new condition as the original ruby slippers in 1938/1939 when Judy Garland as Dorothy wore them during filming. 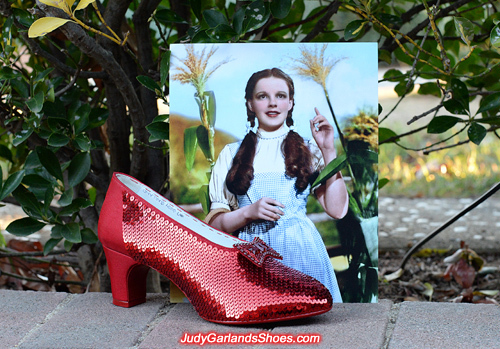 This pair of size 7 hand-sewn ruby slippers will be wearable like the originals. 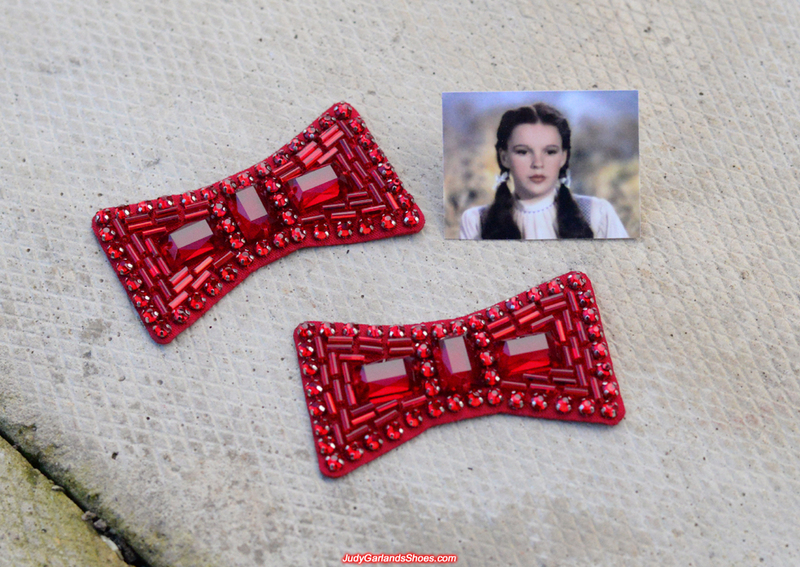 Below is a beautiful pair of hand-sewn silk fabric and thin leather bows that we we will be using for this project. All the materials (high quality glass rectangular stones, rhinestones and bugle beads) are custom-made to match the same materials on the original bows. 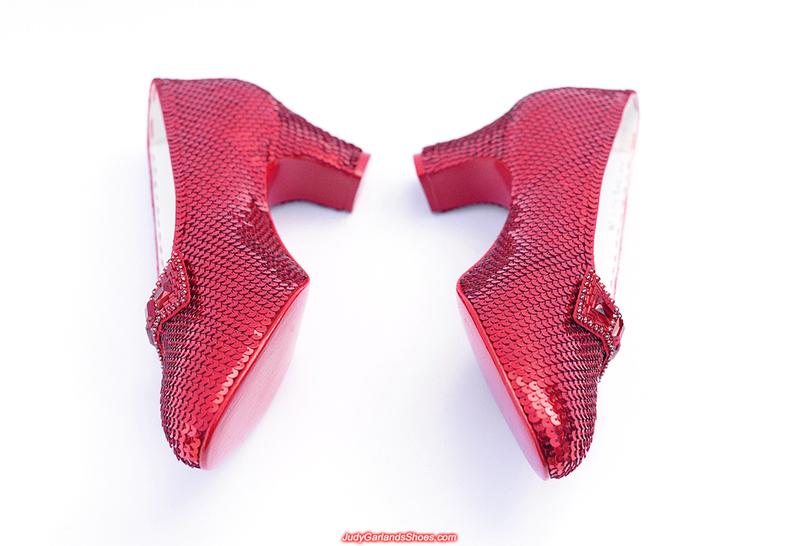 The bows are made a bit bigger so they go well with the bigger women's size 7 shoes. Judy Garland as Dorothy wore a size 5. 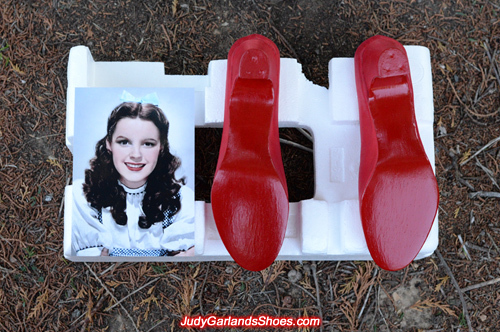 The leather soles and heel caps are applied with three coats of shiny red paint. 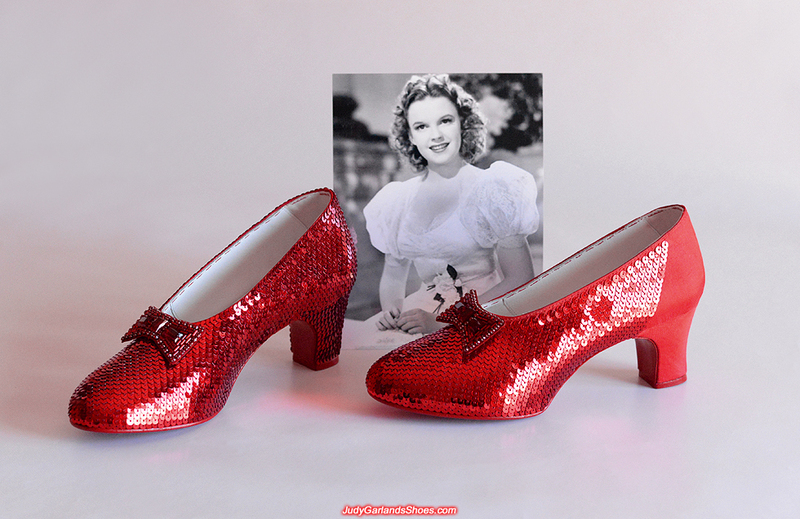 Below is a pair of size 7 ladies shoes with 1930's style wooden heels, all handmade from scratch to match the shape of the original ruby slippers. 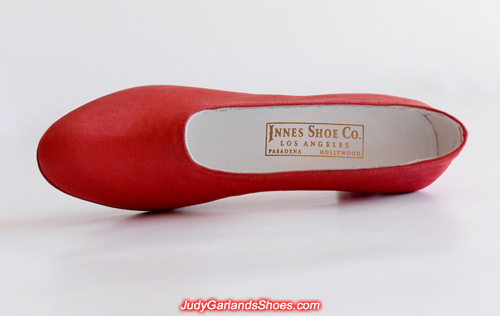 Our shoes can be worn or used for display. 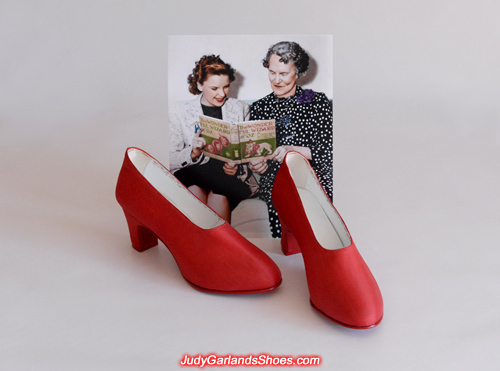 The shoes with leather and silk fabric overlay is crafted to look brand new, just like in the year 1938/1939 when Judy Garland as Dorothy wore a brand new pair of ruby slippers in The Wizard of Oz. "#7 Judy Garland" is written along the top of both shoe. 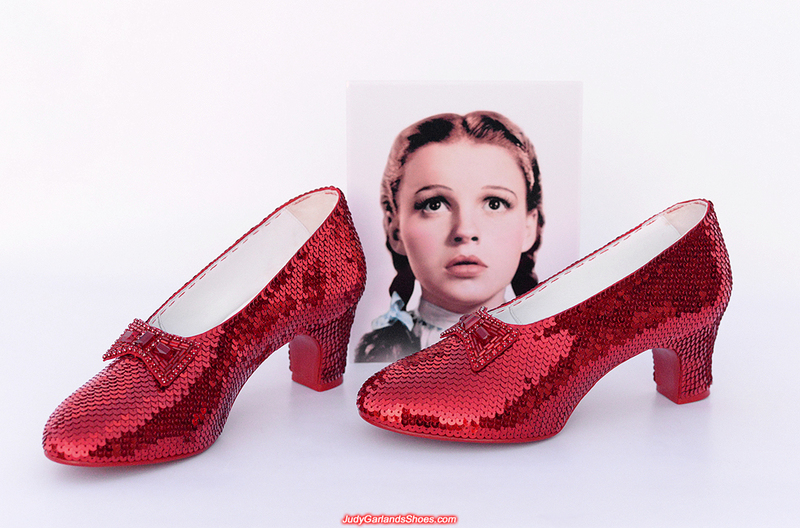 The number doesn't represent the shoe size but a reference for the studio so they don't get the ruby slippers mixed up because they had more than one pair used for filming. A beautiful golden embossed label is included inside the right shoe which reads "Innes Shoe Co., Los Angeles, Pasadena, Hollywood". We are dealing with the enormity and complexity of the task that lie ahead of us as we sequin a size 7 shoe. 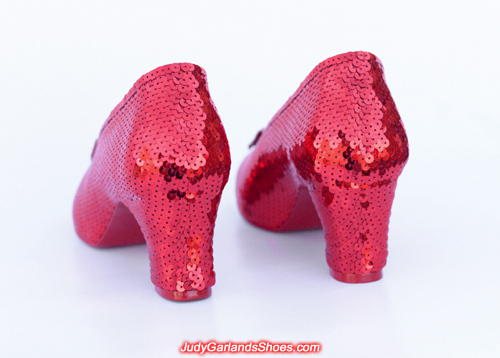 The placements of sequins on the shoe is flawless so far, we are meticulous on sewing them very neat. 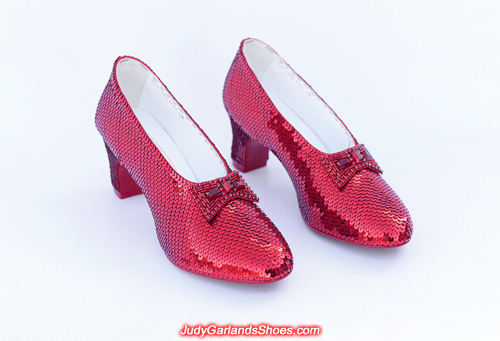 Sequining is going at a slow pace on the right shoe that is bigger than Judy Garland's size. Speaking of the actress, isn't she just beautiful! 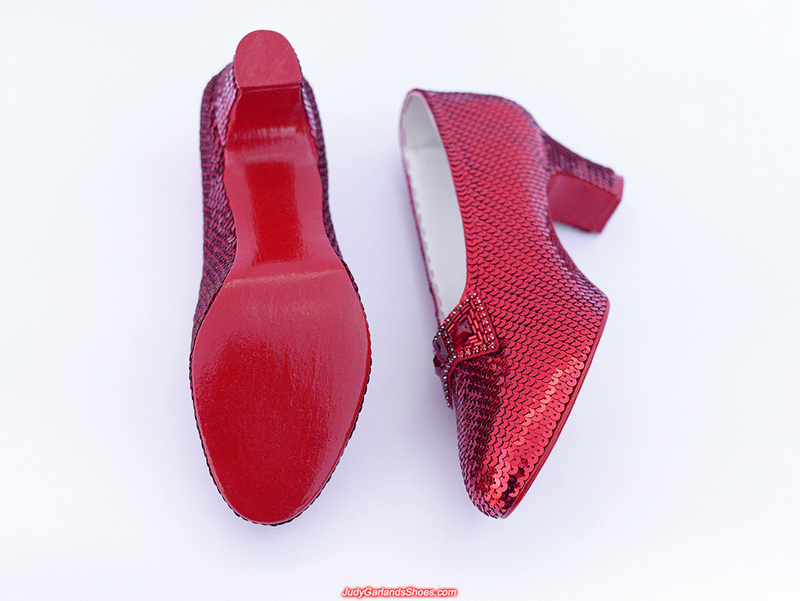 The beautiful right shoe is done but there's still a long way to go with this project as we now turn our attention to sequining the left shoe. A ray of beauty; though of a different size, they appear identical to Miss Judy's size. Excellent worksmanship. The ruby slippers in women's size 7 is finished and they look unbelievably stunning. 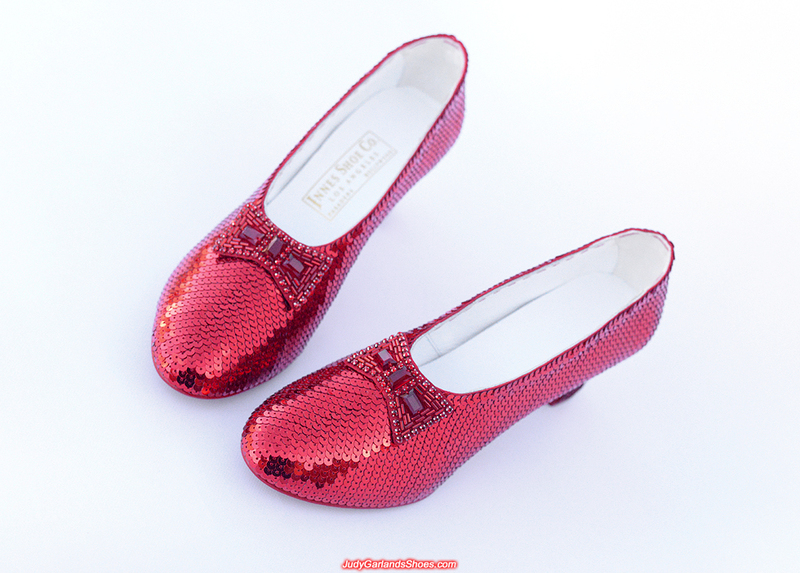 Over 6,000 sequins have been carefully sewn with attention to detail onto the shoes to produce the "ruby" effect. 6,000 tiny 5mm sequins and not 6,000 shoes. 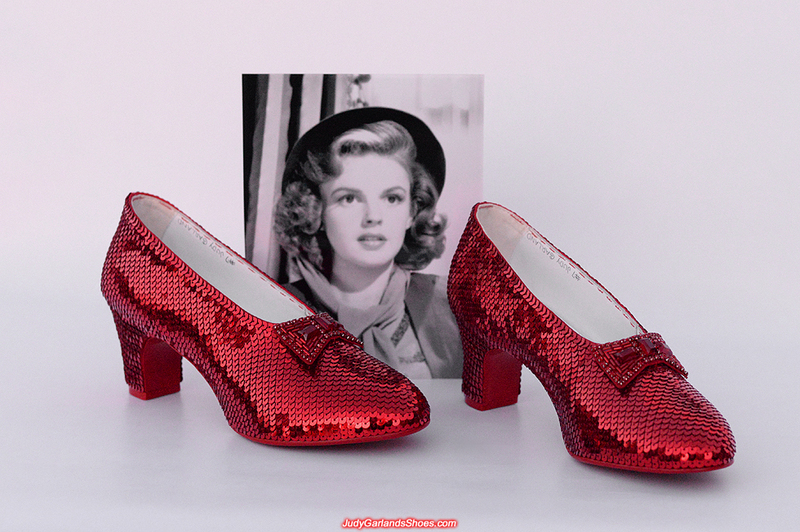 There's no way I could make 6,000 of these iconic shoes in my lifetime. It's a very time-consuming job that involves meditation, steady fingers and good eyesight because you're sewing by hand for long hours every days. I'm probably a bit generous with the figure and it's more likely I sewed about 7,000 sequins directly on this pair of size 7 ruby slippers because a pair of ruby slippers in Judy Garland's size 5 holds nearly 5,000 sequins. 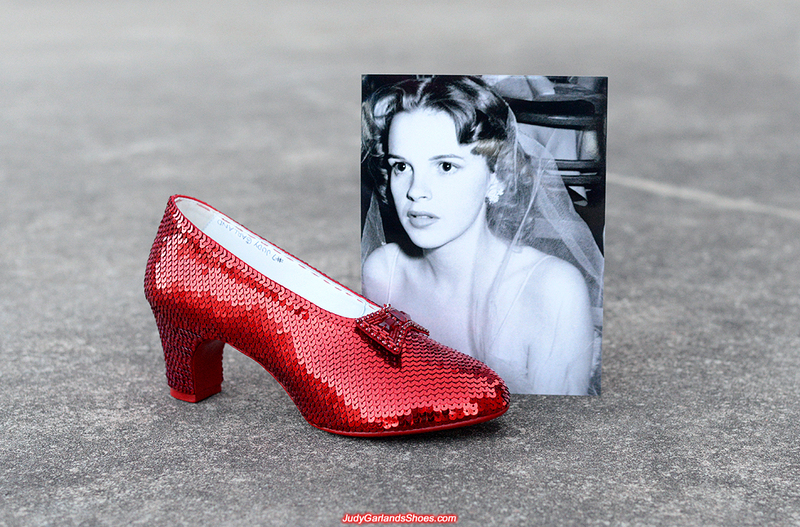 We hope the magic of this pair of ruby slippers make all the dreams and goals come true for the new owner. 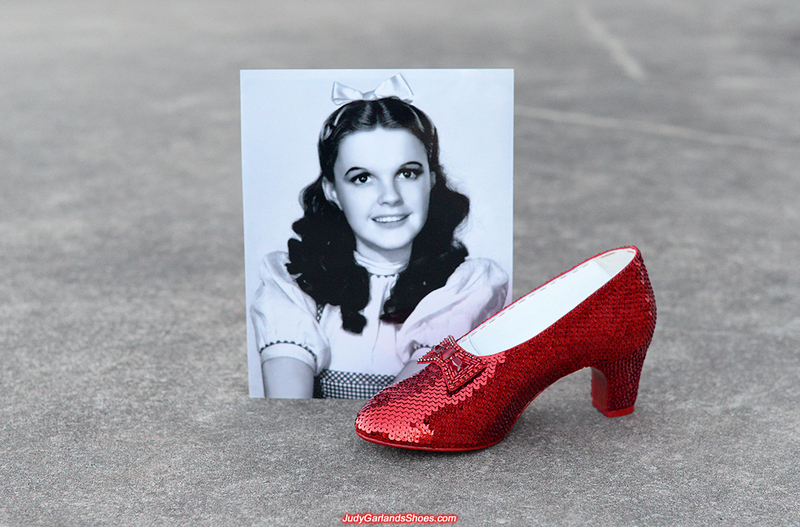 If you had an army of Munchkins you could produce 6,000 pairs. But then they would not have the scarcity value. Usual Beautiful work.